Boa Constructor Building and Design, established 1988, is a general contracting company dedicated to the design and construction of ecological systems. We are remodeling experts, and our main focus is on homes and how they relate to their environment and the people who live in them. Or maybe, more clearly defined, our focus is on people and how we relate to our home environment; how can we shape our built environment to support our needs? 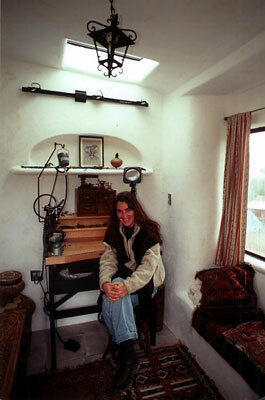 Our portfolio is organized into strawbale and woodframe. We build and design and build new homes, granny units and studios, etc. 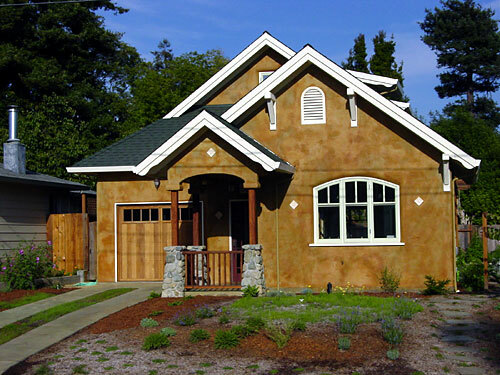 We also do residential remodels and additions. Whatever the medium of construction, our commitment is to support green and sustainable building practices. When we are the designers, our first priority is to design within your budget using passive solar, energy efficient design. Our company uses FSC Forest Stewardship Sustainably Harvested and/ or engineered wood for framing, we design for reduced EMF electrical wiring, we use on demand hot water heaters, our homes and remodels have solar hot water and photovoltaic electricity, we insulate with recycled cotton or cellulose, we use formaldehyde free joint compound, we earth plaster, we use low or no VOC paints, we use flyash in our foundation cement mix, we use reclaimed wood, we recycle and more. We relate to the landscape. We separate grey water and catch rainwater for use in the garden. We understand how important it is to plan carefully, to run our company as efficiently as we want your house to run when we have completed your project. We communicate, we design and we build as a team. We form lasting friendships with our customers that have been tested by the rigors of a remodel or new house project. It is an intense process that deserves and requires complete attention. Boa Constructor Building and Design is a member of U.S. Green Building Council, Ca. Strawbale Association, Built It Green and the Master Builders Assoc. Strawbale bulling has its own peculiar funness...It brings people together. It's sculptural in nature and lends itself to bringing art and spirit into a home that performs well environmentally. I enjoy working with people to design, build and fulfill their dreams. Besides doing custom homes, I like working with what people have to creatively change or add to their existing homes using natural sustainable building methods wherever practical and possible. I have always been an artist. Bringing art into whatever I do makes my life joyful. I have delved seriously into different mediums throughout my life: jewelry design and fabrication, textile art and, for the past for the past 11 years, Natural design. I specialize in many aspects of design approached from an artist’s unique, creative perspective: Interior and Exterior Architectural Detail Design, Interior Design, Floor Plans, Full House Design and Advocacy. I enjoy supporting clients and buildings through the complicated process of 'becoming'. I lovingly and attentively create specific spaces individuals and families need to thrive in. For me it all started with a dream soon to become a crazy reality of living our ideals, of living as close to nature and as integrously as we possibly could in this world that seems to support very different motivations, to swim upstream. It bore itself into a life of homesteading, home schooling, hard work, soul searching, deep questioning and fruitful beauty, artistic expression, humble contentedness, and change, constant change... Change of priorities, ideas, directions. 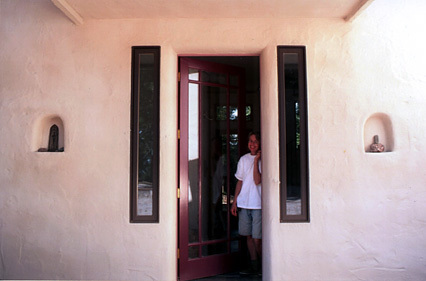 12 years later we are living in a beautiful strawbale home. It is like no home I have ever lived in. After one year I am awed by its beauty and functionality everyday. We have spread our humble beginnings out into the world to extend community, make ripples of change and support the needs of our family. Fruition will not be rushed. As the artistic director of Boa Constructor, my favorite opportunities are working with clients and immersing myself in colors, textures and details of a home. I enjoy the creative process of holding all of this and synthesizing it into a space that feels calming... integrated, beautiful and most importantly, livable. Homes are created for those who live in them. It is where we love, work, study, renew ourselves, seek solace and support.... It is the well that sustains us in this crazy world. A home should feel like its occupants. It should hold and nurture them and create a space for all of the infinitely important, seemingly mundane things that make up our lives. It is a gift to be a part of creating this for others. We typically have 4-10 employees, each one a gem excavated from the rough of the “trades”. They are responsible, conscientious, intelligent , devoted and hardworking and we are lucky to have each one of them.